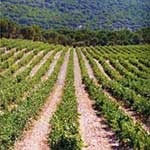 Visit to one of the important wineries with wine tasting and other products, e.g. cheeses. Description: Halfway between Madrid and Santander lies one of Spain's fastest developing wine regions, Ribera del Duero. It spans the broad valley of the river Duero east of the city of Valladolid, encompassing lands belonging to four Castilian provinces though the most significant are in Valladolid and Burgos. Then Ribera del Duero is not a new wine-producing region, since wine has been produced here for centuries, but until relatively recently there were only two bodegas whose wines were available outside the district -- Vega Sicilia and Penafiel. The association of the banks of the River Duero with the vineyards and wine goes back more than 2000 years. Today, after the so called "expansion'' of bodegas in this small region, a lot of its wines can be found worldwide. and its reputation grows stronger every day. Without doubt Ribera del Duero has become Spain's best red wine region. On this wine excursion you will be start of by driving with your private chauffeur to the Ribera del Duero region which is about 2hrs away from Madrid. Here in the quaint wine town of Quintanilla de Onésimo you will visit one of the important wineries of the region with a commented wine-tasting of the 3 of the wineries fabulous wine with some complimentary tasters of products (e.g. Cheese, etc..) from this land. Then a enjoy a gourmet lunch after the visit in the restaurant of the winery offering fine local cuisine. 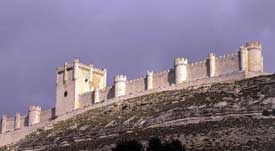 After lunch your chauffeur will take you on a driving panoramic tour to see the vineyards in the surrounding area and then making a stop in Peñafiel to visit the regions wine museum within the Castle of Peñafiel. You will be returned back to Madrid by highway and dropped off at your hotel and final goodbye from your chauffeur. For a marvellous opportunity to sample wine in Madrid, try our wine classes for groups or individuals.